Late in the first quarter Wednesday night, Canadian basketball phenom R.J. Barrett veered around a Ryerson defender to throw down an emphatic dunk. Late in the first quarter of his college coming-out party, Canadian basketball phenom R.J. Barrett veered around a Ryerson defender to throw down an emphatic dunk. He and teammate Zion Williamson celebrated with a chest bump that was almost as big. Making his Duke debut in his virtual backyard, the electrifying 18-year-old from Mississauga, Ont., made his first game in a Blue Devils jersey a memorable one, scoring a game-high 34 points in an 86-67 pre-season victory over Canadian university's Ryerson Rams. "It was great to get to go out there with my brothers in my hometown. It was special for me," Barrett said. "A lot of excitement, a little nervous with it being the first time wearing a Duke jersey. "But for me, playing in front of the fans is great. I got to see mom and dad in the crowd and everybody in Canada. It was cool." 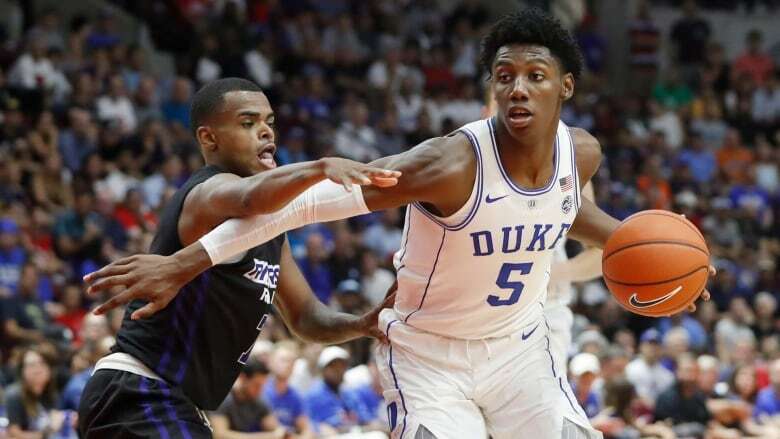 Williamson added 29 points and 13 rebounds, and Duke didn't have another player in double figures as the two young stars provided a highlight-package preview of what should be a thrilling NCAA season to come. "Those two kids . . . they're all about winning — they get it," said Duke's Hall of Fame coach Mike Krzyzewski. Barrett certainly showed zero signs of first-game jitters, and on one particularly memorable play late in the third quarter, he found Williamson with a halfcourt lob for an alley-oop that brought the crowd to its feet. "I don't think he's a kid that ever gets nervous and he's never afraid but he's excited. He's proud," Krzyzewski said. "He's represented Canada internationally and this is his home. He's proud to be at Duke. He's proud, proud, proud about so many things, and you want to play great. "I thought he played really well but he'll play even better as this moves along." NCAA rules permit teams to take an international trip once every four years, and the Blue Devils opted to head north for the first time in the program's storied history. They'll play the University of Toronto on Friday, then head to Montreal to face McGill on Sunday. Fans were eager to catch a first glimpse of not only Barrett — the presumptive No. 1 pick in next spring's NBA draft —but Duke's top-ranked freshman class that includes Williamson and Cam Reddish, who are ranked Nos. 2 and 3 behind their Canadian teammate. Both games at the Paramount Fine Foods Centre sold out quickly. Wednesday's affair was being streamed on ESPN, and drew a media contingent several-dozen strong. Wednesday's pro-Duke crowd included Portland sharpshooter and fellow Mississauga native Nik Stauskas and 10-time NBA all-star David Robinson. Barrett is already being touted as perhaps the greatest player to come out of Canada. The six-foot-seven swingman won both the Gatorade Player of the Year and Naismith Player of the Year last season to help Florida's Montverde Academy to an undefeated season and coveted U.S. high school title. He also led Canada's U19 team, coached by Ryerson's Roy Rana, to its historic gold medal at the 2017 U19 world championships. "I told R.J. at the end of the game in the handshake line, it's nothing but love. I want to see him do well and I think he's going to have a tremendous 'one-year' career at Duke," Rana said. JV Mukama led Ryerson with 20 points and 12 rebounds. The Rams, back-to-back Canadian university silver medallists, held their own for much of the first half against one of the NCAA's most prominent teams. "You're not going to see an athlete like R.J. and Zion Williamson every day so I think that bodes well for our season as we move forward," Rana said. "We were able to compete for 40 minutes and had some stretches where I thought we looked really good against one of the top teams in the NCAA and an iconic program. "As far as the experience is concerned, I mean, wow," he added. "Not only the fact that it's Duke, but an incredible crowd, great energy, just a real celebration of basketball in our country, really." The Rams led 17-15 to end the first quarter, and Tanor Ngom, a Senegalese sophomore, ignited the crowd with a huge dunk over Duke's Alex O'Connell early in the game. O'Connell left the game and was taken to hospital with a suspected orbital bone injury. The Blue Devils started rolling in a second quarter highlighted by Williamson, who showed size-defying athleticism when he scored on a huge putback dunk. One sarcastic fan hollered "Show us something, Zion!" At six foot seven and 285 pounds, Williams is an enigma. He could easily be mistaken for a college football rookie, yet has the leaping ability of a high jumper, breaking the Duke record with his eye-popping 45-inch vertical leap in team testing. The Blue Devils took a 40-28 advantage into the halftime break, and led 65-48 with one quarter left to play. Duke was technically the home team, despite the proximity of Ryerson's downtown Toronto campus, and the capacity crowd — an arena sellout is listed at about 5,400 — was a sea of Duke blue. Tables on the arena concourse were selling special edition Duke Canada Tour T-shirts. Video footage of Duke's boat tour of Toronto Harbour from earlier in the week was shown during a timeout. And an hour before opening tipoff, a long lineup of Blue Devils fans stretched down the sidewalk of what was formerly the Hershey Centre, eager to get the first glimpse of this season's squad and its homegrown Canadian star. Duke is fourth in NCAA all-time wins, while Krzyzewski is the NCAA's all-time winningest coach with five NCAA titles. He also led the U.S. men's national team to six gold medals.